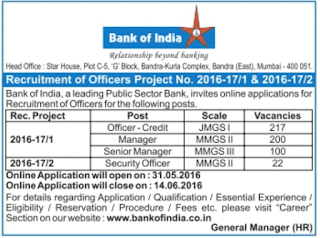 Bank of India (BOI), a leading Public Sector Bank, invites Online Applications for recruitment of following Officers posts for filling up 539 Vacancies in BOI Recruitment Project 2016-17. 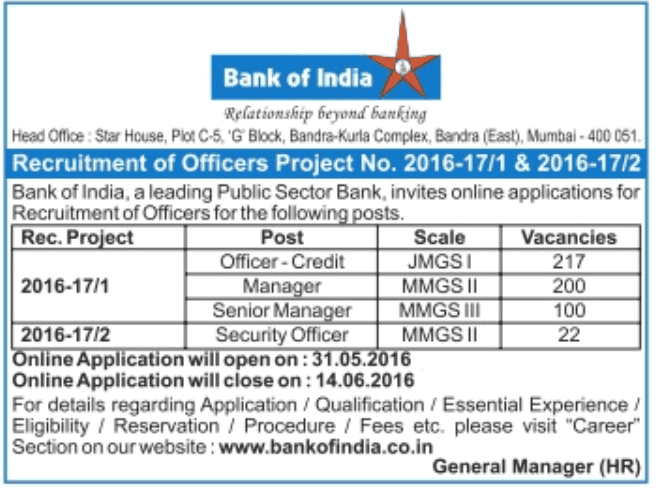 The Online Application open from 31st May 2016 and close on 14th June 2016. Eligible Interested candidates are required to fill Online Application FOrm. The Online Registration will open on 31/05/2016 and the online registration will close on 14/06/2016. For details regarding Application / Qualification / Essential Experience / Eligibility / Reservation / Procedure / Fees etc. available from 31st May 2016.